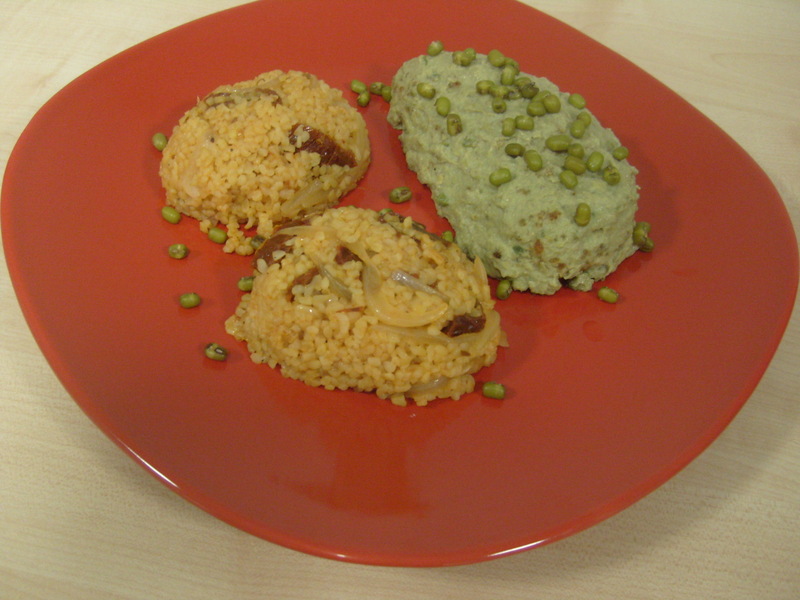 The first couple of the fusion kitchen is “bulgur” and “cod”. Bulgur is a widely used ingredient in Turkish cuisine and is obtained simply by pounding the wheat. Wheat that is separated from its skin is first boiled, dried and then crushed to small pieces (It is still homely-produced especially in rural areas of Turkey besides the manufactured type). Bulgur generally has two kinds; the one with bigger grains is used for making bulgur pilafi (with various kinds of additional ingredients) and the other is for making bulgur balls or used in different recipes (especially recipes with red meet) for its taste as well as its merging characteristic. By the way, the second one resembles cous cous in its appearence. Cod is a fish that is naturally not available in Turkey while it is abundant in UK (Its Turkish name is ‘morina’). For most of the time, cod fish is used in UK’s popular dish ‘fish& cips’. From the first time I ate it (it was in a restaurant when I exactly have no idea about what kind of fish I am having; I was just trying the famous fish & cips), I like it. It is a delicious fish with a pretty white color. Without looking for any cod fish recipes from the web, I bought 2 cod fillets from the supermarket (I have no beforehand information, it was totally instinct J). They were covered by crunchy crump and they need to be cooked in the oven for 20 minutes in order to be ready to eat; so easy. As a part of my searches for new tastes, I bought a pair of avocado for £ 2 which I can’t even dream of getting it at this price in Turkey. When I tried it, I was about to hate avocado. But I realized that it was different from other tropical fruits such as pine apple, mango or dragon fruit (it is no good to eat avocado rawly, it needs to meet with other tastes) as I looked through recipes using avocado. Then, I decided not to give up avocado but try it in an alternative way. I came up with a common avocado sauce with garlic and yogurt which sounded nice and it is the one I used in my cod fillet recipe, of course with some new touches. Bulgur pilafi is a popular dish in Turkey; as rice pilafi you can make it with a variety of additional stuff meaning that it is an ingredient with a huge potential for innovation. 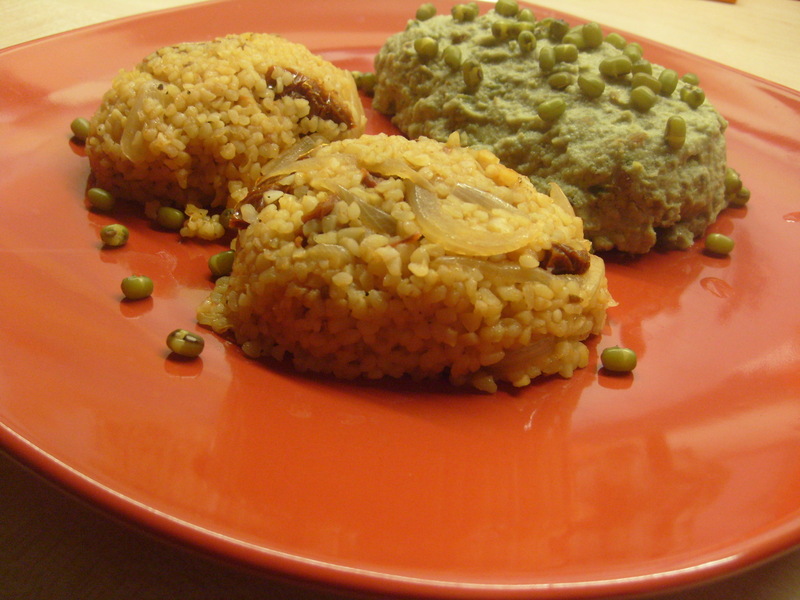 Bulgur pilafi is very easy to prepare and offers much for your gusto: one of my favourites! In this recipe I added dried tomatoes and onion. Here you are..Enjoy the recipes! Preparation: Chop the onions vertically in order to get long pieces. Fry them in some vegetable oil (preferably olive oil) or butter till they get slightly pink color and then add the tomatoe puree and pieces of dried tomatoe. Fry them by stiring for 1 minute and lastly put the bulgur to the saucepan and fry once again for another 1 minute. The amount of hot water that you will add to the ingredients is the crucial moment. The trick is that: pour hot water into the saucepan until it covers and exceeds the top of the ingredients by 1 cm. The pilafi will be ready to be served in 7-8 minutes at mild temparature. After all the water drains, take away the saucepan from the cooker, open the cover and put a cotton sheet over the saucepan. The excess water vapour will be absorbed by this way and it will prevent your pilafi to become mushy. PS: I’ve come up with a lovely mung bean recipe at lovely Cafe Fernando at http://cafefernando.com/mung-bean-salad. I surely advise you to check it out! This entry was posted in Fish, Pilaff. Bookmark the permalink.